Organised By: Arm Marathon Foundation, Yerevan City Administration, TriClub multisport club and the Coca-Cola HBC Armenia. 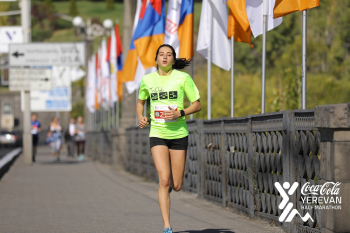 Yerevan Marathon is an annual long-distance running event organized in Yerevan, capital of Armenia, and is the successor of Yerevan Half Marathon organized in 2015, 2016 and 2017. On October 21, 2018, for the first time, in addition to the Half marathon and shorter distances, Yerevan will host a full Marathon distance. General Sponsor of the event is Coca-Cola HBC Armenia. Coca-Cola Yerevan Marathon is organized by Arm Marathon Foundation, Yerevan City Administration, TriClub multisport club and the Coca-Cola HBC Armenia. The Marathon starts in the very center of Yerevan, near Republic square. The route takes runners through beautiful central streets of Yerevan and to Hrazdan River gorge, later returning to start location. The Half Marathon route is precisely measured and certified by AIMS. Marathon route awaits certification. All runner results are measure with precise timing equipment (Mylaps).